This lightweight construction method ensures a payload reserve for the installation of furniture and technology, without exceeding the maximum permissible payload of 3.5t. The permissible gross weight of 5.4t ensures a safety reserve even with full tanks, by utilising 3 axles rated at 1,800kg each from Knott GmbH. 9.50m long x 2.55m wide x 4.00m high. 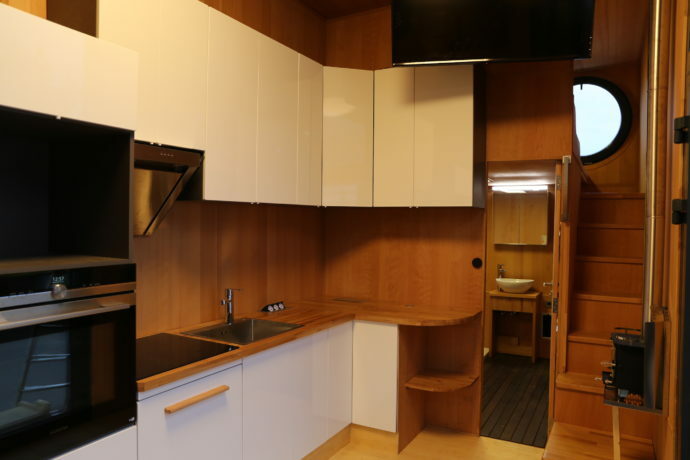 Total living space including 2 sleeping lofts is circa 30m². 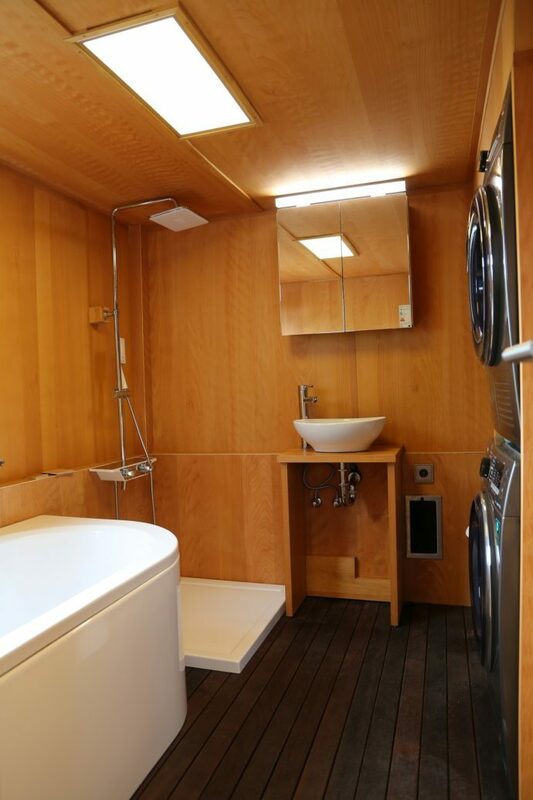 Bathroom with bathtub, shower, macerator toilet, Japanese bidet. Hot water boiler, fully automatic washing machine, heat-pump tumble-drier. Kitchenette with 335L fridge-freezer, oven with microwave, induction hob with 3 hotplates totalling 5.6kWp, dishwasher. Living room with 55″ Smart TV and mini woodstove. Spare room with door closed at the rear is universally usable e.g. as a walk-in closet or children’s room. 1 x sleeping loft at the front above the bathroom with a double bed and 43″ Smart TV. 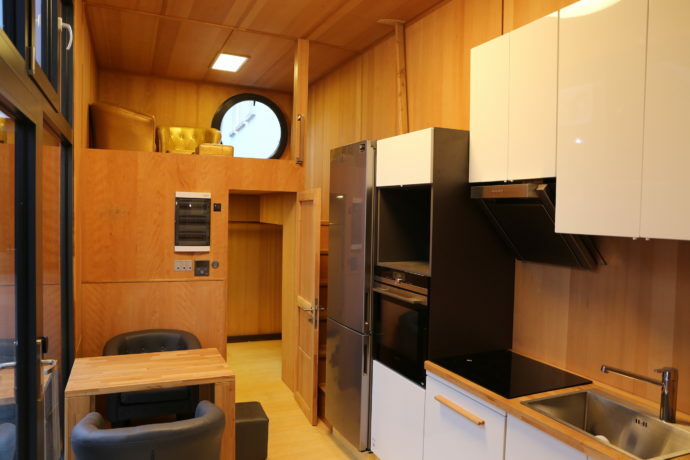 1 x sleeping loft at the rear above the spare room with a single bed accessible via wooden stairs. 500l fresh water tank, pressurised water system and rain collection system – where rainwater landing on the roof is passed via 2 pipes into the tank. 3.5kW air source heat pump. 4kW air to air heat pump air conditioning. 30 x 110Wp on the roof. 16 x 100Wp on the upper sidewall. 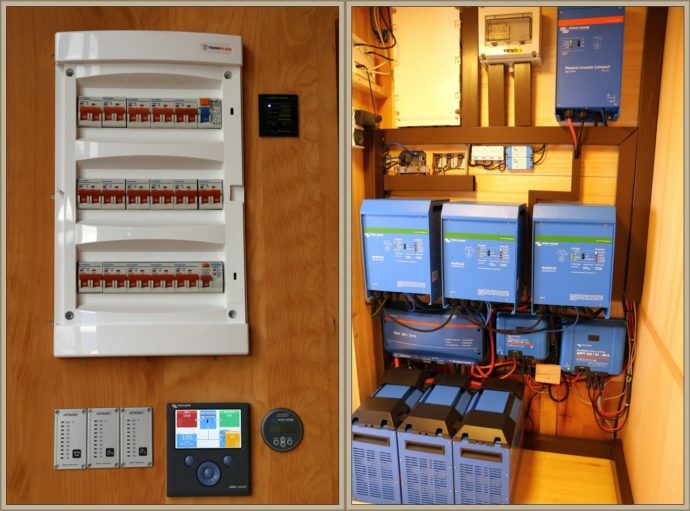 1 x Victron MPPT Solar Charge Controller 250/100. 1 x Victron MPPT Solar Charge Controller 250/60. 3 x Victron Multigrid inverter/chargers. 24V/3000/70 for 7.2kW continuous power and 18kW peak power. 3 x Victron lithium storage batteries. 24V – 200Ah 5kWh each giving 15kWh in total. 1 x 1000A Victron Battery Management System (BMS). 1 x Victron Color Control GX. (A Multi Energy Management and Communication System). 1 x Victron BMV-712 Battery Monitor. 1 x Victron VE Transfer Switch 5kVA for shore/generator power. 16 x 230V power outlets. 2 x Protective safety switches. 1 x Honda emergency generator 2.2kW. Huawei Mobile LTE WIFI Internet router with 2 external aerials. 4 mechanical jacks operated by a cranking handle with 1.5t fittings. 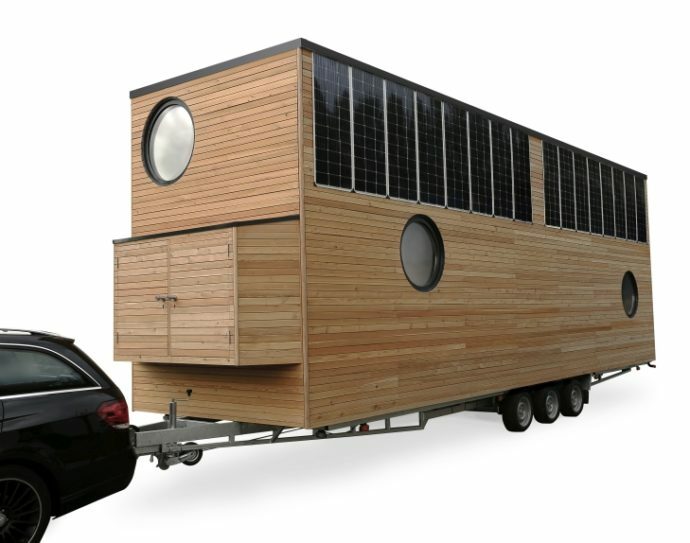 These are integrated into the Tiny House allowing the house to be easily separated from the trailer. Window glass made of WSG safety glass. 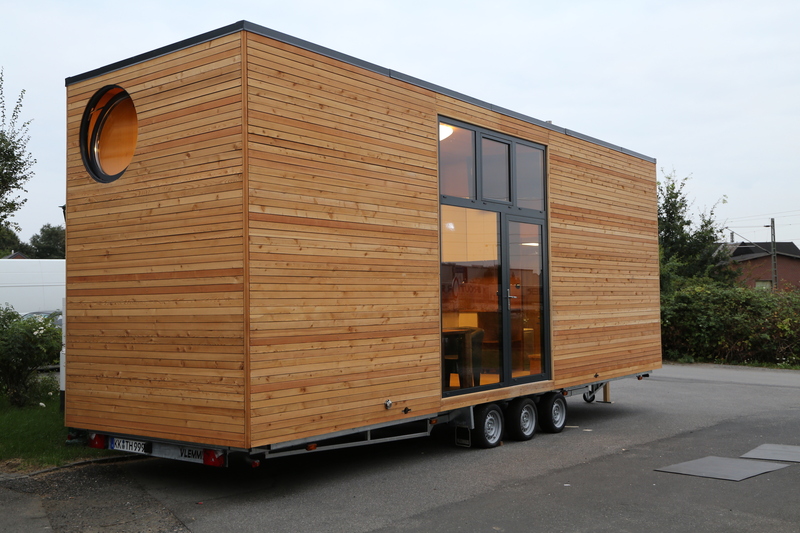 It’s clear that if you can manage to get along to Caravan Salon Düsseldorf 2018 there are multiple stands showing Victron Energy products and interesting implementations of those products, for exciting leisure activities – such as energy self sufficiency in a Tiny House. Worth a visit I’d say. My thanks to Wolfgang Felzen of GreenAkku, also Uwe Dräger and Marianka Pranger of Victron Energy for the images and information used in this blog.